My name is Daniel Nielson, Director of Environmental Services at Parham Doctors' Hospital, part of Henrico Doctors' Hospital. We've been rated a top 50 hospital for nine straight years. We're very happy with the new design of the RCP Slim Jim Step-On. It looks more like a piece of equipment, or almost like a piece of furniture. It reduces the wall damage with the internal hinge. The clearance of the foot pedal makes it easier to use, as well as having a flat foot pedal, which makes it easier to clean. The new version of the Slim Jim Step-On is very quiet. You don't hear it at all. Our CP made a great change with the new Slim Jim Step-On by adding the new cinches inside, so you don't see the trash bag hanging out over the edges. The larger opening is more user-friendly from the staff perspective. [Cornelia Corbett] My first impression of the Slim Jim Step-On is the sleek design, and I really like the stainless steel. And it's very durable. [Nielson] We're confident in having a product in our patients' rooms that's factory mutual certified. We absolutely recommend the new RCP Slim Jim Step-On for all other health care facilities, and we appreciate our CP working with us. If you're considering the Slim Jim Step-On trash receptacle, then hear what our customers have to say about it! Check out this customer testimonial from the Director of Environmental Services at Parham Doctors' Hospital to find out why they recommend this product to all health care facilities. 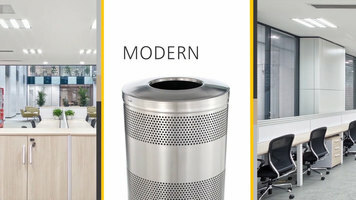 With a large variety of options available and the capability of being customized, the Rubbermaid Decorative Refuse receptacle line is ideal for all types of modern establishments. Check out this video to learn more about what this line has to offer! 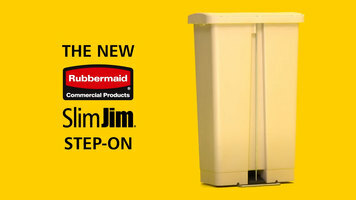 Explore the functionalities of Rubbermaid Slim Jim's space-efficient and hands-free trash cans by watching this video. From a slender profile and quiet closure to optimal durability, these containers have your businesses needs in mind! 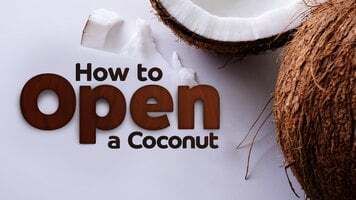 Watch this video to learn how easy it is to open a coconut with the proper tool!